Focused attention and mental absorption, to the exclusion of other sensory inputs, are seen as catalysing altered states of consciousness. The author discusses meditation; some research on meditation suggests that blood flow to brain regions involved in directing attention decreases during meditation, while the flow to areas associated with sensory perception increases. However, other research suggests increased activity in both areas. It is thought that these findings might reflect different stages in meditation. 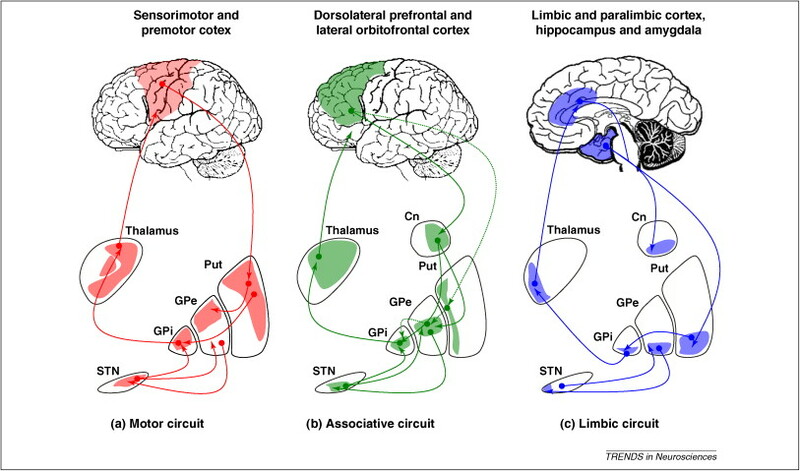 In general, the circuit of orbitofrontal, dorsolateral, anterior cingulate, striatum and thalamus are found to be involved in focusing of attention, while the temporal and parietal lobes are more involved with the actual process of meditation. Focused attention is a factor in meditation with a single set of signals being enhanced while other signals are excluded as irrelevant. Alpha brain waves and increased serotonin activity in the prefrontal characterises a reduced flow of signals from the body. This state is induced by top-down attention rather than being initiated by any external signal. Such attention is also apparent in any type of mental absorption as with films, plays, music, works of art or natural scenes. Serotonin is here also suggested to play a role in suppressing extraneous influences. Blissful sensations reported in some meditation may associate with increased dopamine in the striatum, and also with theta waves in frontal areas, which may inhibit intrusive thinking. Damasio similarly reported that heightened emotional state could reduce cortical activity and increase subcortical activity. The same change of balance has been observed in reactions to music. 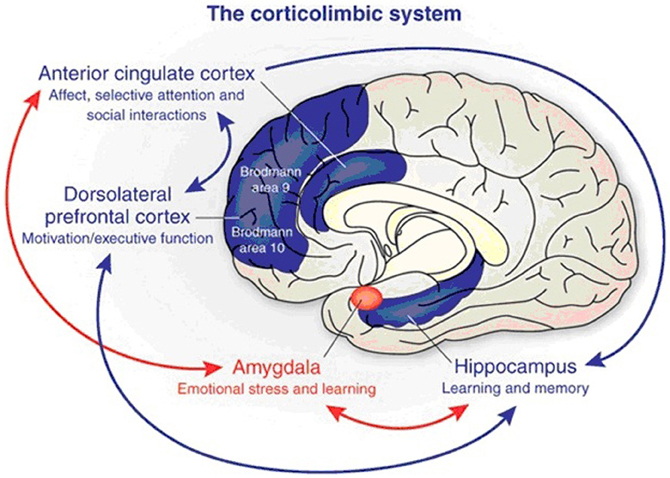 The anterior cingulate appears to have a role in the interplay of attention and emotion. Its dorsal components interact with the prefrontal, orbitofrontal, striatum and thalamus, and it thus plays a central role in attention. However, the ventral components of the anterior cingulate interact with the emotional related regions of the amygdala, ventral striatum and the anterior insula. The anterior cingulate is a target of the dopamine system and is seen as active in studies of meditation. The anterior cingulate and the insula are thus found to be involved in a range of experiences such as meditation, trance, and epilepsy-related experiences. This may be related to particular populations of spindle neurons. Such cells are only known in larger-brained mammals, and the populations in the anterior cingulate and insula may be unique to humans. It is argues that the orbitofrontal and anterior cingulate originate a cortical-striatal-thalamic-cortical loop. This shifts attention towards sensory or emotive inputs that may be experienced as blissful or even ineffable. In its normal state the brain is only stable for 120 ms before reorganising, but it is suggested that this could be extended in altered states, and this may be associated with the entrainment of neural oscillations.